Animal behaviour is a subject that has always fascinated me. At first glance, the actions of animals seems so familiar, obvious to the point of not being noteworthy. They eat when they are hungry, they run when danger is present, and they get down to it when, you know, they want to. What I find really interesting is the debate that so often crops up as to whether these behaviours are instinctual, built into the genetic makeup of the animal, or learnt through experience and upbringing. In other words, is it nature or nurture? I’d like to answer by saying that in most, if not all, cases, the answer is never nature or nurture. It is both. To back up this claim, there was an article published in the Journal of Neuroscience regarding how infant mice recognise their mother. 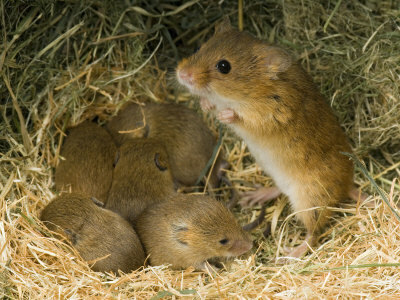 Like many mammals, mice are altricial – they are dependent on others to nourish and protect them. This role is usually carried out by the mother, and so there is a very good evolutionary pressure for infant mice to be able to recognise this individual. Mice are born blind, and the only alternative they have to distinguish their mother from all others is by smell (olfaction). Indeed, it is known that mice pups die quickly when their sense of smell is disrupted, as they cannot find their mother to suckle. One would expect, therefore, for baby mice to have a well developed sense of smell, despite their fragile, infant state. Curiously, the neurons responsible for smell are immature at birth. However, the olfactory sensory neurons (OSN) develop continuously, and within 2 weeks the newborn rodents are able to distinguish many different smells including that of their mother, siblings and food. Here we can see how nature and nurture are working together to allow the baby mice to survive. Natural selection has created mice with olfactory systems that develop within the first few weeks of birth. However, the mouse’s preference for one smell over the other is based on its upbringing – its nurture. Were the mouse pup to be raised by another individual, it would prefer the smell of its adopted mother. The study in Neuroscience showed that mice pups born with a non-functioning OSN show no preference for their mother over any other individual. The nature/nurture debate has clouded many issues over the years, and in my opinion, demonstrates a misunderstanding of evolution. Natural selection is responsible for selecting certain genetic sequences over others, because they confer advantages on the individual. The advantage exists because it allows an individual to more easily survive or breed in a particular environment. Change the environment, and the advantage could easily be lost. A fur coat is vital in the Arctic, but deadly in the desert. Mice need the genetic ability to recognise their mother by smell, but the environmental plasticity to recognise different smells dependent on where they grow up. The same is, of course, true in humans. We all have the ability to develop calluses on our skin – the thickening of the skin protects us from constant friction. It is an evolved trait, there are genes hidden away in our DNA that allow us to regulate callous production. The fact that guitar players get them on their fingers and people walking without shoes get them on their feet is a testament to its environmental nature, as well as its genetic origin. For 3 months, I travelled around south east Asia,writing about my experiences as I went. Here is my archive of travel writings.